Luke Bryan's national anthem: The line is at 2:09 and based on what we know about Luke he's a fun loving guy so, the odds he stays under in front of the biggest audience of his career is unlikely. I'm going OVER and I'm saying 2:31 for that final note. 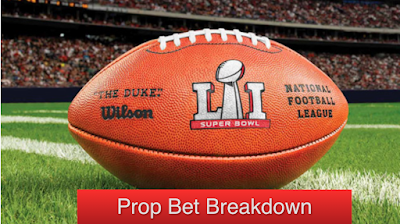 Coin Flip: The greatest prop bet ever, you have a 50-50 chance at being right. Gut feeling is "Tails never fails"
First Score: This is a two for one. I'm giving what the first score of the game will be (TD, FG, Safety) and who is scoring it. I think it will be a FG by Gostkowski to give the Pats a 3-0 lead. Of course, it could be a Blount TD, Julio Jones Masterpiece, or the rare Brady Safety. We all know the deal, Gaga is performing and if you're a fan you want a hit single of hers to be the first thing when she hits the stage. I think differently, she just had a new album come out and she knows the prime time for people watching are the first 60 seconds (before bathroom/nacho re-fill break) I think the song "A-Yo" is what she comes out with, it's upbeat, sets the mood, and makes sure people stay to hear the classics. Yes, there will be at least 1 second half turnover. In a game with stakes as high as this one there is no way someone doesn't break under pressure. Super Bowl MVP: This basically depends on who you think is winning the game. The easy choices are Brady and Ryan, because the QB's always get the love nowadays. I'm going with the Falcons winning, but it will be Julio Jones holding that trophy. Belichick will try and shut him down, but it won't work Julio is on a different level right now. Keep it in the back of your mind. That's it for the Prop bets for us, but you can listen to the random other picks we had on our podcast starting at the 33:50 mark.